Rice crackers made by roasting three kinds of beans, smothered in all sorts of flavoring like sesame, soy sauce, plum, and red pepper. 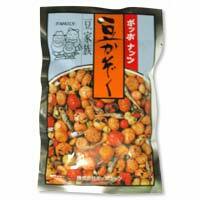 Japanese people like to eat sweet and spicy snacks alternately. Sink your teeth into these crunchy treats and you will certainly enjoy the crisp light texture with the taste of beans. And the little fish fry will add even more to your enjoyment.